SINCE the season of 1998/99 the Irish rugby provinces have been making strides in European Rugby. Ulster lifted the European Heineken Cup that season, with Munster losing to eventual finalists Colomiers at the quarter final stage in Toulouse and the Reds went on to win their two titles in 2006 and 2008. Leinster followed with three titles and they too are confident of a good campaign in the current series. At this week’s Munster press day much of the talk centered on the Paris 4G venue, the challenge ahead and the confidence within the Limerick-based camp. The squad trained on the UL 4G pitch this week with Peter O’Mahony pointing out that these pitches are nothing new to any of the teams playing in the Guinness PRO14. It will no doubt be a strange feeling to have former Shannon star Donnacha Ryan to cope with, particularly in the lineouts but Munster are seasoned campaigners in Europe. Their record speaks for itself and they inflicted Racing’s heaviest defeat in this competition last season, losing by 25 points. 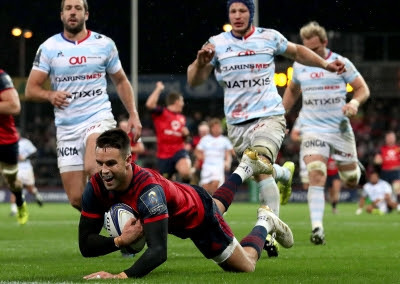 Only Munster have conceded fewer tries than Racing (five) so far this season while Stander, Zebo, Holland and Rory Scannell have played every minute of the four Champions Cup pool games in this campaign. If Munster lose it will be their 50th defeat in European competition (48 Champions Cup and one Challenge Cup) but all these stats are irrelevant once the first whistle is sounded on Sunday. With Munster, the confidence is never far from the surface. The bigger the challenge, the more they like it and they certainly have the players that can do the business, even in the tense atmosphere of a winter Sunday evening in Paris. The French side walloped Clermont last week-end but the Auvergne showed 15 changes from the side that started against Saracens in their previous Champions Cup game. Sunday’s game kicksoff a 3.15 Irish time and is shown live on FR2, Sky Sports and beIN Sports. Referee is Matthew Carley of England with the other match officials also from the RU.